That's my point actually. Drives me crazy sometimes. Which brings me to the other point: that CPU is only supported on that board from beta bios 1.10 and up. If the board comes with bios 1.00, it may not post, so I'd check the board to see what bios it has (there should be a sticker on top of the bios chip located beside the 2nd 4x PCIE slot). It might show P1.00, and if it does you might need to borrow someones CPU to flash the board. If it says P1.40 (first official bios after 1.00) or higher then you're good. 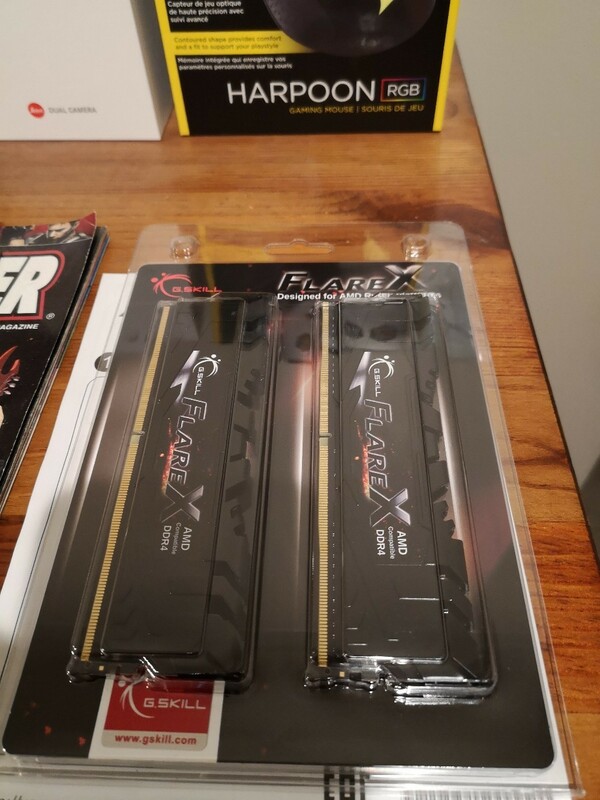 @Tipstaff since I've already ordered new RAM and already arranged to return the other RAM I'm just going to wait for the newer RAM (which is prettier anyhow). Being 400 series board.. all the ryzen 2000 series will work with it out of the box. In a way I'm glad the RAM didn't work. I got a second chance and chose RGB RAM this time around. When my PC came to life it was beautiful to see all the different colors. So me and Judas are making a swap, he gets the G.Skill RAM and I get a nice big hard drive. It's a win win for both parties, I wanted to buy a new HDD for this PC but reconsidered. Now I can have my cake and eat it too. Long live the barter system. I might be getting two 1TB drives! He's testing the drives he has now, and seeing which ones are best. They may be 2.5" drives too. He says some of them are literally brand new and unused. I was rather disappointed when i got into the store and tracked down the green 3TB ... i had indeed previously tested it and marked it with an F.
I've got 2x 1TB drives currently on the test bench running their ultra long extended tests which tend to take about 4-8 hours each. These are the only 3.5" drives i've got. 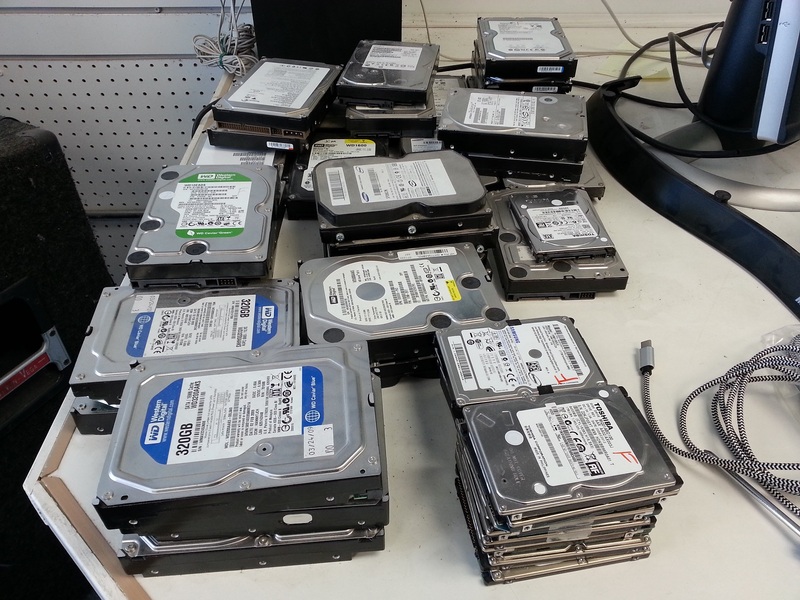 I do however have i think a few, 1-3 perhaps more of the 1TB 2.5" drives that have gone mostly entirely unused, essentially pulled from brand new laptops (swapped out with samsung EVO drives installed in their place). Provided they test good, i could provide these. Alternatively, if i lack that, i've a few 500gb models of the same style drive that were in the same situation. A lot of laptops are still sold with 500gb drives as standard, which isn't honestly surprising since they are typically the smallest and most cost effective and the overwhelming majority of people don't use more than 100GB of drive space on the average. I'm looking forward to the newer drives passing testing. Noice! I might build a media PC instead with them. Edit: 1 drive for music and anime, the other for well I'll see. That's just a small stack of hardrives, of which many are tested and are prepped for recycling (all those marked with F) and some that still need testing. Notice there are no SSDs there since i started getting them roughly 10 years ago? Hahahahaha, I was just poking some fun at you. Thanks again for going out of your way to test the WD Green and Seagate you'll be sending me. Funny story, one of my sticks of RAM was not being utilized by Windows but it was being registered by CPU Z and my BIOS so called Judas and he was like it probably wasn't in all the way, opened up the case and lo and behold it was a little out of the slot, it hadn't been pushed all the way in so pulled it out and re-inserted it and on it went to get registered by Windows, I'd actually been using my PC with just 8 gigs of RAM this whole time lol. which also means you were only operating in single channel only as well. Which means I was right, you would be fine with 8GB till you build a new PC after this one, in 3 months. Looks like I will need to get a new headset too, my Hyper X has finally thrown in the towel after 2 years of successful operation, its mic doesn't work no more. Any suggestions? I want something that will not only sound great but have a sweet mic too as I often talk to my friends on my PC.